M&M Christmas Poem and Download! – It Works For Bobbi! 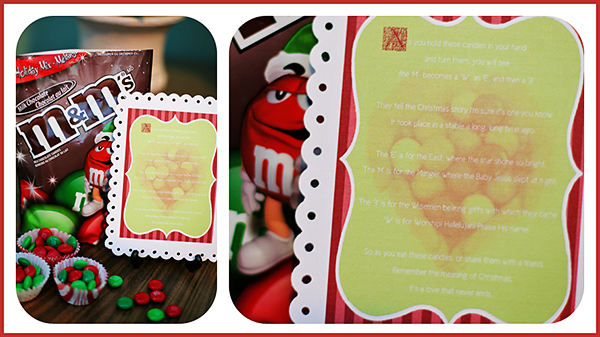 M&M Christmas Poem and Download! Published on December 15, 2010 March 23, 2017 by Bobbi-Jo G.
While out caroling with my family last night, we visited the Temple president’s home and his wife (who is our cousin) gave us a bag of M&Ms with this adorable poem that links the candies to the Nativity story! I absolutely fell in love with it!I knew immediately that I wanted to create a cute printable that I could share with all of you to help you make a sweet and simple gift for teachers, neighbors, or friends! I’m sure it’s one you know. Where the star shone so bright! where the baby Jesus slept at night. bearing gifts with which they came. Remember the meaning of Christmas. It’s a love that never ends! This is so flipping cute!!! I think I will be printing NOW!! Printing!!! Thanks for your help. Totally unique and lovely. Bobbi – you are so talented. May God bless you always. I'm sure it's one you know. A time for us to Ponder! He cleansed all sins for men! Remember the meaning of Easter. It's a love that never ends!